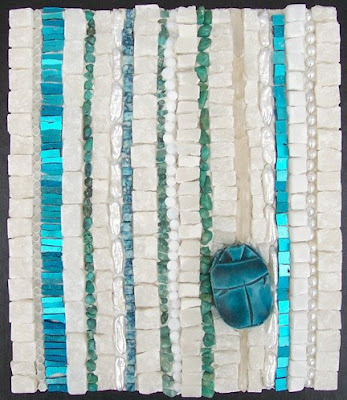 Margo Anton's Mosaic a Day: "Scarab"
In a former mosaic life, I created a lot of mosaic mirrors that I called "Wall Jewelry". My materials have changed a lot since then, but I decided to try to see if the wall jewelry idea would still work with what I use now to create my mosaics. I think it does, although the balance seems slightly off in this piece. I also sharpened my hammer and hardie today, so can't WAIT to play tomorrow.